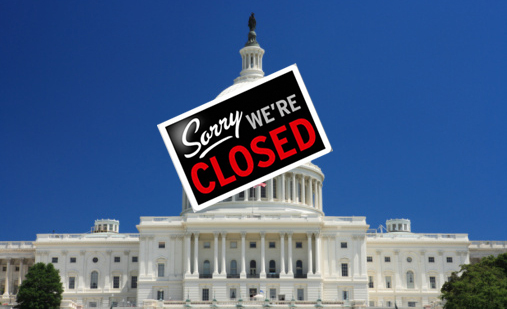 Comments Off on Government Shutdown? I paid a visit today to the California Secretary of State’s Office and the Capitol. Both buildings were virtually empty except for security. I needed to pick-up some documents related to a project I am working on with a friend. While I was there I also got some info related to the November Special Election. I visited offices on two different floors. Between both floors, I saw three people. Many lights were off and all the Dilbert Cubicles were empty. Many publications that should have been available were not in the offices. We were told to try their Internet site because the publications might be there. At the Capitol, I dropped by Senator John Campbell’s office. I wanted my daughter—who was accompanying me—to see one of the good guys. I opened the door and was impressed by two things. First there was only one person in the office. This person turned-out not to belong to the senator’s staff but was simply there to answer calls. Second, the office was a dinky hole-in-the-wall. Not what I expected from a man destined to serve in Congress. The Senate employee was nice and we had a good visit. He let us see the whole office and answered all our questions. Senator Campbell’s office was about twice as big as the walk-in closet at my parent’s house.